It was just after Christmas. Madeira, the island in the Atlantic Ocean, was lapped by the heat of the Gulf Stream. One could not feel the winter: the sky was a cloudless blue, the air was spring-like, the rocky landscape was a colourful mixture of flowers in the rich green. Quite different from Germany, where at the same time raging cold prevailed. There the whole country lay hidden under dense grey cloud cover in dim light and sleet chased people into their homes. But not only the beautiful weather on Madeira had surprised us: the villages impressed us with a lush Christmas flair that we did not know from home. Fairy lights stretched across streets and many houses were decorated with colourful garlands. Finally, in Santa Cruz, we discovered a nativity scene that I was instantly attracted to. It stood in the middle of flowerbeds in a square. 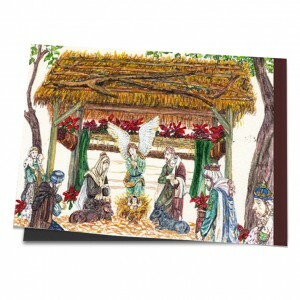 The figures were life-size and beautifully designed, the stable was airy and decorated with many red-flowered poinsettias. “I cannot help it, I must stay here and paint,” I said to my husband Klaus and sat down in the shade of an old tree on a park bench.